I’d like to tell you about an app that will make your life a little bit easier. It’s called Out of Milk and I use it every day. 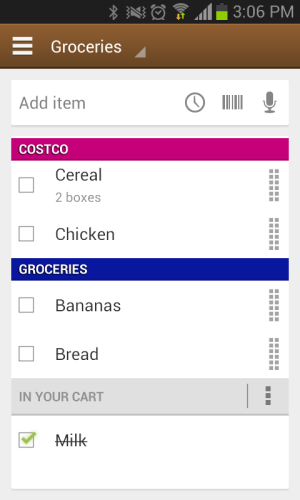 Out of Milk is an app that coordinates your shopping, grocery and to-do lists in one place. The app is currently available for Android mobile devices and will soon be available for the iPhone. Also, once you have an account you can update your lists on any computer. I’m currently using the very full-featured free version of the Android app but there is also a Pro version that can be purchased for $1.99 that will give you a few additional ways to customize the app. In addition to pros such as widespread availability and low cost, I find Out of Milk really easy to use and feel comfortable recommending this app to any level of user. 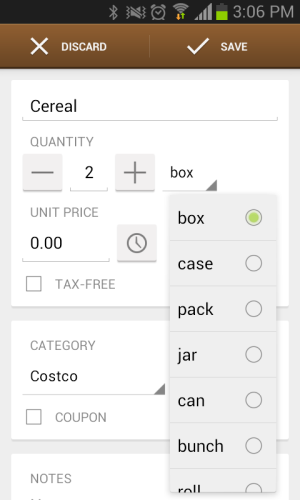 My absolute favorite feature of Out of Milk is that you can share lists with other people so they’re also able to see and edit them from their own mobile device or computer. I find this especially useful if my husband is picking up a few groceries on the way home. This gives me a way to pass along all of those little details without overloading him with information on the way out the door in the morning. (Although I would never do that.) 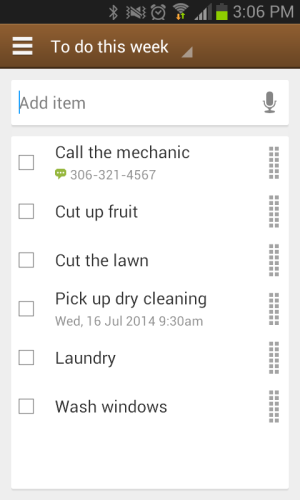 🙂 Another useful scenario – if he knows that I’ll be picking up groceries later that day, then he can add items to the shopping list throughout the day and my phone will automatically sync with the latest information so that I have the most up-to-date version of the list I need with no extra effort at all! Of course, we still occasionally get home from a shopping trip and realize that we’ve forgotten one obvious item that wasn’t on the list, but because Out of Milk allows us to always keep our lists with us (who doesn’t have their smartphone with them everywhere they go these days?) and we can both add items to lists with ease, those days are rare and the overall shopping experience has been much more efficient.